Simply place an order of over £100 and you will be eligible for free delivery to UK mainland. Deliveries to N. Ireland, Highlands, Islands, remote areas, countries outside the U.K. and B.F.P.O.’s are subject to an extra carriage contribution; please check cost of carriage at time of order. Orders are normally dispatched within 3-4 working days but if your order is urgent, please contact us, as we always try to help out with a quicker delivery if we can. Every product we sell is covered by the Propeller 100 day test flight. The scheme is simple, you purchase your chosen products, and you then have 100 days to try them in your classroom and if they don't work as we said they would then you can return them for a full refund. This only applies to products purchased direct from Propeller, not our distributors. Every product we sell fits with the 2014 English National Curriculum - please get in touch if you are not clear which objectives one of our products covers. 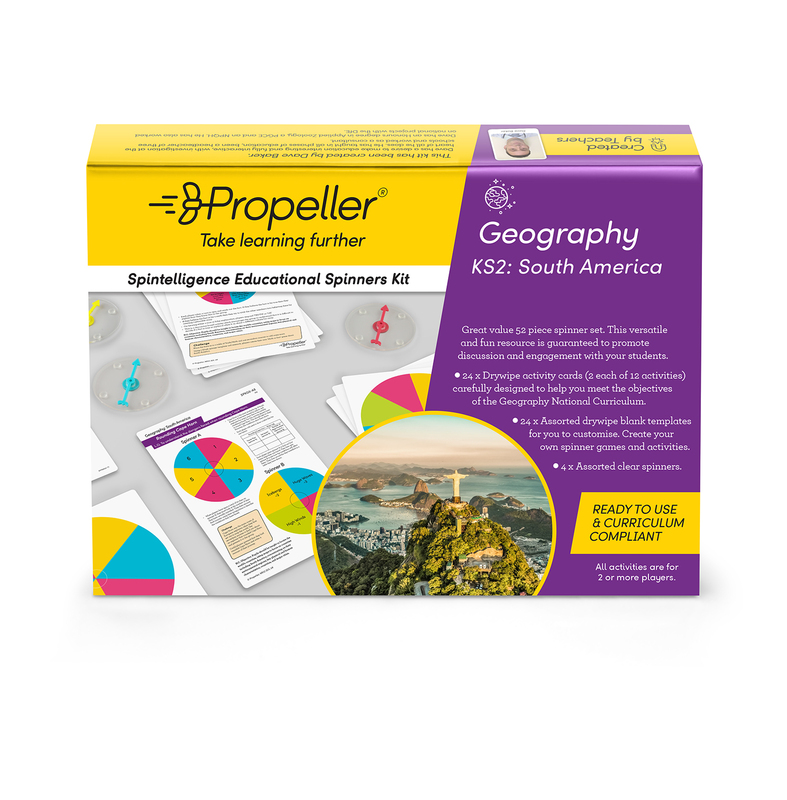 This Geography Spintelligence Kit covers key geography National Curriculum objectives for Key Stage 2 including: locating the world’s countries; using maps to focus on countries including South America; concentrating on their environmental regions and more. 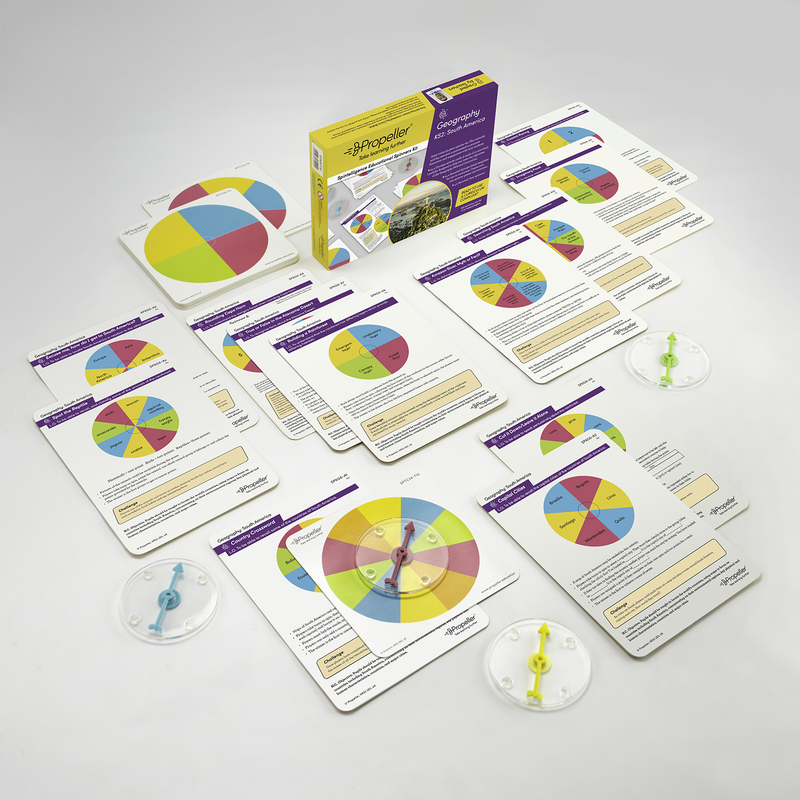 Each kit is ready to use, curriculum compliant, created by teachers and refined in classrooms. 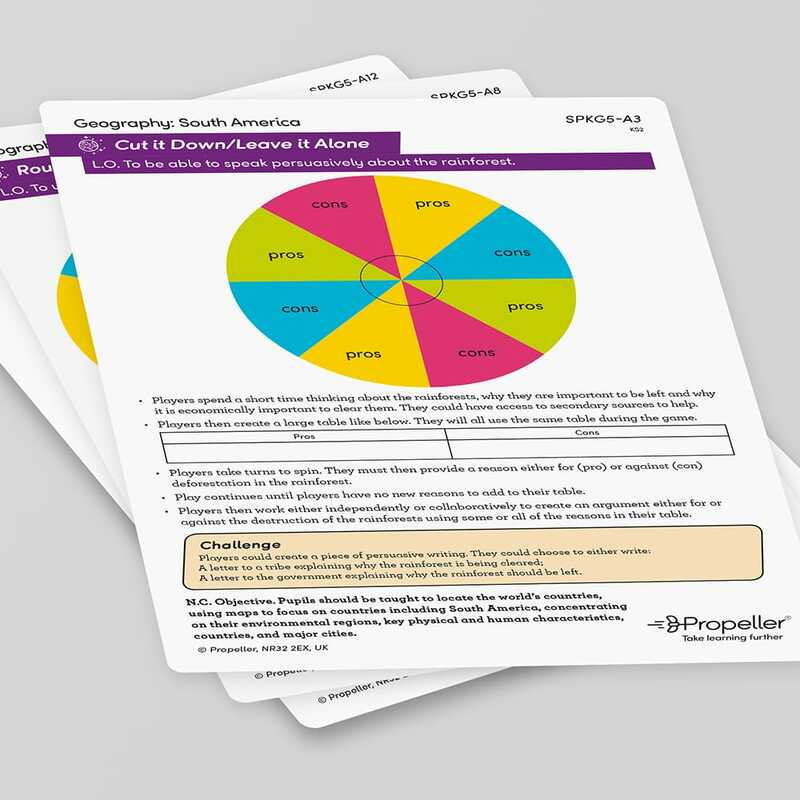 Included are 12 ready-to-use spinner games and 24 blank drywipe template activity cards. © 2018 Propeller All Rights Reserved. No part of this product may be reproduced or distributed by any means, including photocopying as a means of avoiding purchase, except in the case of recording students’ progress, reviewing and sharing through social media, and other non-commercial uses permitted by copyright law. Rest assured that you’re meeting the relevant targets with every game clearly showing its National Curriculum objective. Simply flick through the cards and find the one you need for your lesson plan. Learning doesn’t have to be all pen and paper. 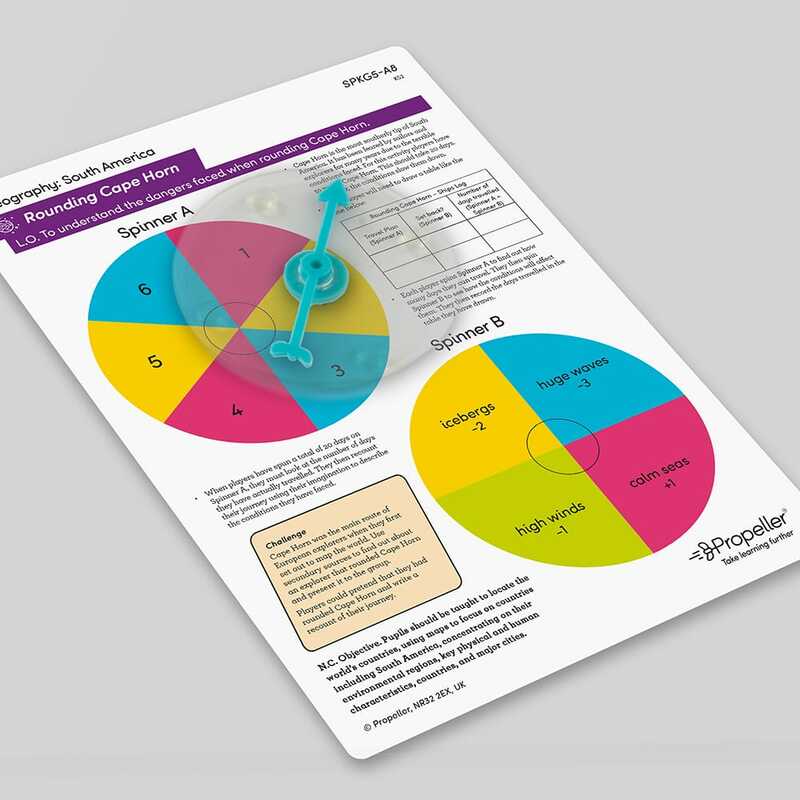 Bring your subject to life with the spinners and games that not only cover National Curriculum objectives, but also develop reasoning and strategy skills that can be applied to many other areas of the curriculum. Every kit comes with a variety of blank, drywipe template spinners so you can take activities further or create your own to make sure everyone can take part in the games. 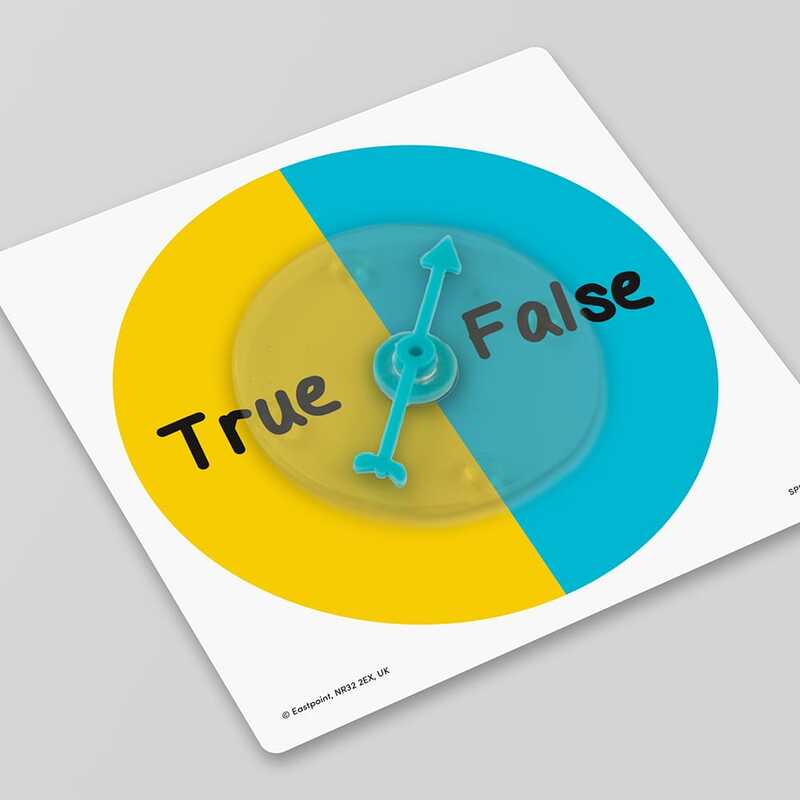 Challenge students to take a game home and compete against their family or take a blank template home and come back with a new game addressing the topic of the lesson. The spinners don’t have to stay in the classroom!